What i see is, from Agra i can have a early start on a day to cover Fatehpur sikri and Bharatpur and evening back to Agra. But i see no late night connection to Jaipur from Agra. I only see..
Next day in the evening board a train to Udaipur..
1) From Delhi i could hold of hardly two trains.!! 2) Is there any way that i can take off from Agra to Fatehpur sikri..then visit Bharatpur and then continue to Jaipur the same day evening. 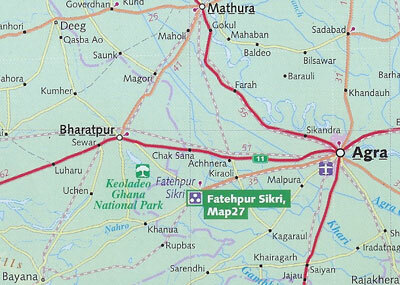 3) Is the Fatehpur Sikri- Bharatpur can be done in a single day!! I believe bharatpur park closes at 18:00 Hrs. !! Someone - else will have more knowledge of trains. However, you don't seem to have much time in Udaipur. It is worth visiting Ranakpur from Ud. - a full days trip. Myself - I would get into and out of Jaipur as quickly as possilbe - very aggressive touts made my time there almost unbearable, and although the palace was good, the touts just spoiled everything. But we each have individual experiences. Have a great trip! Originally posted by: mindi Myself - I would get into and out of Jaipur as quickly as possilbe - very aggressive touts made my time there almost unbearable, and although the palace was good, the touts just spoiled everything. I loved Udaipur, I stayed 2 nights but it is worth even more. Ranakpur is not so near, but I think it can be done in a one day tour. Sorry I can't give you trains info. I hired a driver so we stopped in Fatehpur going from Agra to Jaipur. It was great! Thanks guys for your reply. I will keep in mind your valuable suggestion. Villavic: How much it cost for you to hire a driver and went to Jaipur? From where did u book the taxi? May be Steven is looking into this post and let us know some better train options. As you seem short on time, I would say that it's possible to see Fatepur Sikri and Bharatpur in a day, spending half a day at each place. However, I think it would be more relaxing and easier on your lungs to stay overnight at Bharatpur and take the train to Jaipur the next morning, arriving in Jaipur around lunchtime. I also rate Udaipur above Jaipur for the reasons mentioned above, especially the persistent touts, although from recent reports on the forum it seems the water levels are currently very low in the lakes at Udaipur. It's really worth taking a day trip by taxi (about 1000 rupees) to Kumbhalgarh Fort and Ranakpur Jain Temples as you also pass through Bhil tribal areas on the way. As 4th Feb is my day planned to go to Jaipur (Friday)..i can only land up in jaipur by night. This seems to hassle my plan for Udaipur too. Even i m considering Udaipur better over Jaipur....As u all are saying about the Ranakpur temple and all...does Udaipur itself has not much things to see?? If i m not able to make Ranakpur trip..is Udaipur not worth it?? I seem to remember going directly by train from Bharatpur to Jaipur a few years ago. Is my memory going? :) I also think we need Steven's help on this. There are also regular bus services from Bharatpur to Jaipur. I think Udaipur is a much more pleasant city than Jaipur, especially the area around the City Palace, and you can also visit the Monsoon Palace in the hills opposite the city. You have obviously done a fair amount of research for your trip and know what you want to see. By the way, how long have you actually got to cover your route? Actually my whole plan is like this...before that, i m spending three days in Delhi and then going for my friend's marriage near Varanasi. Train 1449 departs Mahoba daily at 23:45 and gets to Agra Cantt at 06:45. Mahoba is a 3 hour bus ride from Khajuraho. I believe, as per the thread is indicating..i should cut the Jaipur night halt and go directly to Udaipur. Let me know, if u see any flaws in the plan. Actually speaking..i m most worried about the Satna-Khajuraho and then Khajuraho-Agra travel...b'coz i heard the roads are horrible. Looking forward for your coopertaion. Your itinerary looks tight but well organised. It might be better to leave things just as they are. One adjustment could throw the whole trip into chaos and I imagine you want to pre-book your rail tickets. Yes, the roads around Khajuraho are not among the best in India. The Satna - Khajuraho section should be no problem as you have no deadline to meet but you should allow yourself a safety margin on the Khajuraho - Mahoba journey. From Agra you could also visit Fatepur Sikri and Bharatpur in the same day by taxi returning to Agra for the night. About Jaipur. It has to be said that all impressions of places are personal depending on the circumstances and how one is feeling at the time. Your experience of Jaipur may be completely different to mine. I do think Amber Fort is worth visiting. If you can possibly manage it, do the Ranakpur/Kumbahlgarh day trip from Udaipur, but this is really tricky by public transport so you will need to hire a taxi. By the way, I was wrong about the direct train from Bharatpur to Jaipur. Well, actually I hired a complet program, with tours and hotels, 14 days: DELHI / AGRA / JAIPUR / UDAIPUR / RANAKPUR / JODHPUR / JAISALMER / BIKANER / MANDAWA / DELHI. I recommend Compass tours, they prepare you the program exactly what you want. If you want just a driver, or with tours, with hotels (the category you want), anything.! Durjay is very kind and good preparing services. You may mention me, Carlos Villavicencio from Peru (maybe the only peruvian he knew), I was in april this year. The only thing I didn't like about the tour guide (not from Compass, I guess from any tour guide) is that they take you every time to shops (rugs, pottery, marble, every day! I got sick of that! Do they think you will buy every day??). So if you want just driver and enter the places by yourself, you can hire drivers from Compass also. Thanks Alan and Villavic for your suggestions and advice. I am definitely going to keep your pointers in mind..and will surely let u know about the progress of my plan. I am still hopeful that..Steven Ber will have a look at my choices and advice me on my train combinations. I will have a look at the train options tommorow when I have more time. Though there is some gauge conversion work going on in that area at the moment and I don't know exactly what lines are affected or when the work will be finnished, I will try to find out tommorow. I'm afraid that I'm struggling with this one. The line between Agra Fort and Bharatpur is closed at the moment whilst the line is converted to Broad gauge, so the only train between Bharatpur & Bandikui that I can see in the new timetable is train 303. The direct trains from the Agra area to Jaipur go along the line past Fatehpur Sikri, though there are no well-timed trains. Another problem is that the line to Udaipur is metre gauge and most of the network is broad gauge, it seems that you’re going to have to spend a day on the train no matter what route you take, this combined with you're reluctance to go to Jaipur (you'll get worse hassle in Agra & Fatehpur Sikri), leads me to suggest another route. From Agra, get a bus to Bharatpur, try to arrive very early, spend about 5 hours in Bharatpur then get a bus or taxi to Fatehpur Sikri and spend a few hours there. Train 282 departs Fatehpur Sikri daily at 19:59 and gets to Bundi the next morning at 07:23 (it stops at Kota from 05:25 till 06:35)(the train also gets to Chittaurgarh at 10:35). Train 282 departs Bundi at 07:25 and gets to Chittaurgarh at 10:35. Train 9020A departs Bundi at 09:33 and gets to Chittaurgarh at 12:00. Train 9943 departs Chittaurgarh at 14:00 and gets to Udaipur at 18:00. I would suggest that you get the early train to Chittaurgarh, put your luggage (and partner ;) ) into the cloak room (Rs10 per item, must be locked) then go for a walk around the town for a few hours. the site comes up with "Train no longer stops at this station" does anyone know if this is an error? if i were you and had to see so many places in so few days 'd have skipped bharatpur first thing. stores of people comming back after seeing a few crows and c couple cranes are not uncommon. its overrated. people who go to see tigers in "tiger resrves" very often have similar experiences. besides you can get a bird santuary everywhere - nothng perticular to india. second, while its true that jaipur si the kind of place where it will be very eacy for the touts to take the unsuspecting india-virgin foreigner for a rde, it would be foolish to miss out on the likes of amber fort, city palace, hawa mahal and the jantar mantar/man singh's observatory. amber fort is a particular big hit with foreigners. and if you need further convncing about chitoregarh then go here. http://lroy.addr.com/Rajasthan/Chitt...ittorgarh.html. so thats it from me. no bharatpur. jaipur conducted trip must. chose chitore over ranakpur.